A new arts and culture initiative which will help to develop skills within the sector, promote positive health and well-being and raise awareness of traditions from a bygone era through arts, crafts and performance has been launched. The Challenge Fund, co-funded by Fermanagh and Omagh District Council and the Arts Council of Northern Ireland will be delivered under three themes; ‘Arts for All’ concentrating on health and well-being, active ageing and inclusion; ‘Multiple Identities’ focusing on musical cultural traditions and ‘Loughs, Bogs & Mountains’ addressing rural arts, traditional skills and the environment. The programme, which will run until October 2019, will be delivered in partnership with a number of organisations including South West Age Partnership, Royal Scottish Pipe Band Association (NI) and Dún Uladh – one of Comhaltas Ceoltóirí Éireann’s seven regional centres, Sliabh Beagh Arts, An Creagán and a number of other venues, local organisations and individual artists. Front Row: Ian Burrows, Seán Ó Roideáin, Martha Balfour, Patricia Donald, Councillor Chris Smyth, Ita Kavanagh. Back row: Bryony May, Ann Farry, George Latimer, Mary Murray, Allison Forbes and Bill Smith. 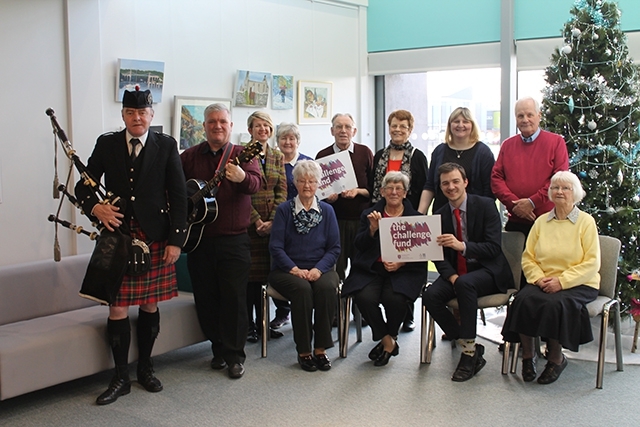 The Challenge Fund will make a total investment of £250,000 across the district, each of the programme themes will provide a series of arts, crafts, performance and training workshops and activities for various groups in local communities. The activities will result in the creation of new artworks, development of new skills and expertise, exhibition and performance opportunities and increased capacity across the arts and cultural sector in Fermanagh and Omagh. The Challenge Fund will also deliver an Artist in Residence initiative, bringing distinguished artists into the district to undertake a wide range of activities engaging with local schools, businesses, community groups and artists. There will also be support for local artists including an unprecedented opportunity for an artist to undertake a residency at the Centre Culturel Irlandais in Paris, with prospects of making European and International connections. Finally, a programme of technical and theatre training will take place across the district for local voluntary, community and amateur drama groups and young people. “Fermanagh and Omagh District Council is excited to be part of the Challenge Fund. We are keen to see the arts being used as a tool to address a range of social issues including health and well-being, to see the delivery of arts and cultural activities taking place in a rural context, in our townlands and villages. I would hope this programme will respond to the needs of our local communities and a leave a lasting benefit beyond the duration of the programme”. “We are so delighted to see £125,000 of Arts Council National Lottery Funding going to such a fabulous Challenge Fund bid. It is such a varied programme but the ‘Arts for All’ stream of activities, focusing on older people and harder to reach communities is doing exactly what the Arts Council’s Challenge Fund was designed to do – to bring great art within everyone’s reach. We thank the Council for taking up the Challenge Fund which is helping to strengthen the arts infrastructure in the area through international and local artist residencies, capacity building programmes with existing cultural groups and providing new, exciting community arts programming for all”.